Bluethumb is a rapidly growing community of over 8,000 Australian artists. Our mission is to connect artists with collectors and empower them to create a sustainable career in the arts. To succeed we focus on developing custom technology, backed by a specialised team of logistics and digital marketers. We combine this with deeply rooted local curators and artist liaisons. For our trade partners and commercial projects we not only offer the largest national network of artists, but exclusive access to some of the most sought after independent emerging artists. At Seein, we design and craft unique printed glass, wood & aluminium products, specialising in architectural printed glass to enhance any setting, home or business. Through years of research and development, Seein are at the forefront of digital printing. The stand out quality we produce comes from over 20 years experience in the glass and printing industries. We put our Heart and Soul into our designs, manufacturing, installations & our service. "It's our quality that sets us apart"
Emma Thomas is a Melbourne based artist, who believes that art is the soul of the home. She's inspired by tropical water and nature. Emma uses many different mediums and offers a range styles, shapes and finishes. There are ready made pieces, and can be viewed in Melbourne's Eastern suburbs and Australia wide postage is available also. Custom pieces can be made as well, please email Emma for more information. 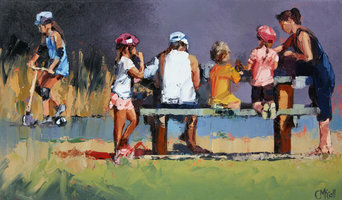 Strongly influenced by impressionist art, Australian artist Claire McCall paints light-filled images of everyday beach scenes and childhood memories. Custom work welcome. Alex&Elle, as agents for Arvidssons Textil and Kinnamark, import Scandinavian designer textiles directly from Sweden. The fabrics are available by the metre or in Alex&Elle wall art, lampshades, cushions etc, handmade in Melbourne. 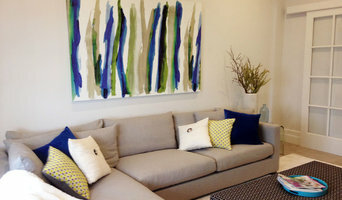 "Our largescale and unique fabrics enhance the warmth, look and feel of any room in your home, office, cafe or restaurant; be it as wall art, cushions or other furnishings." High performance acoustic insulation, which reduces noise and improves the ambiance of every space, can be integrated into every piece of our fabric wall art. Form and function in harmony - true to Swedish design tradition! 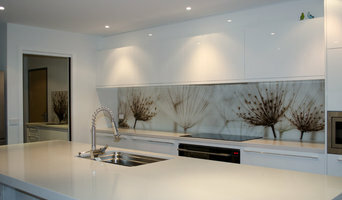 VR Art Glass - splashbacks with art. Specialists in the area of printed glass splashbacks – Visual Resource draws upon a successful career in photography spanning image creation and photo quality printing. VR Art Glass is the culmination of these skills to provide you with an impressive splashback unlike any other. I am a fibre artist and work with natural fibre like 100% Australian merino wool, silk, flax, cotton, bamboo and mote. My wall hangings are very tactile, they invite you to touch and feel them. We are naturally drawn to the soft environments. In the preindustrial revolution times, all homes were handmade, gentle and soft. If we take a closer look to any culture, especially indigenous, and their habitats – be it Native Americans, Mongolians or any of the ‘Stan’, Nordic or Baltic nations, their walls were decorated with soft animal skins, felts or handmade drawings. Their daily home environment was gentle and soft and their whole life was closer to nature and more respectful to it. Wool as a material is fire resistant, eco renewable, biodigradable, non toxic and a natural insulator. The Artist that actually allows your input to come up with the artwork that is just for you. Commissioned Art for home & business. Clients see the range of artworks to choose from and Mendo works closely with you. Shakiraaz is a homewares brand that offers products for the home ranging from cushions, throws, baskets, bedspreads, all of which are handmade & handcrafted. Shakira Lima, owner of Shakiraaz is a Melbourne based textile designer who creates her own prints & also handprints her textiles in house in her studio in Melbourne, we also get some of our products handcrafted by Indian artisans overseas. The ethos of our brand "Shakiraaz" is to offer a handmade & often a bespoke product for ones home or home decorating needs, all products are carefully crafted using eco friendly methods & natural fabrics. Emma Morgan was designed west of London, in England, circa. 1991. She moved to Melbourne, Australia with her parents not long after, where she grew up drawing pictures of her cat and climbing trees. As Emma spent most of her time involved in art, design and music she decided to further her art education and completed a Bachelor of Visual Arts at Monash University in 2012, with a focus on graphic design, painting, drawing and printmaking. Predominantly working in pigment ink pen and watercolour on a larger scale, Emma likes to explore themes related to the social context of animals. 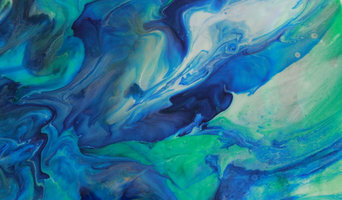 Emma both exhibits some of her more conceptual, one off pieces of work, and also creates a more commercial range of art prints and homewares. Emma is very passionate about conservation, and hopes to one day use her art powers to create more awareness for vulnerable wildlife in need. Welcome to my original, quirky and whimsical artwork which comes from the heart. I hope you take a little something away with you to make your day a happy one! I am a designer and artist who loves to create unique work for those of us who don't like the traditional look. I am a textile / graphic designer with over 30 years experience in the industry. Having designed, licensed and sold all manner of products to retailers, manufacturers and individual clients, I am excited to be able to showcase my designs here on Houzz. My designs are eclectic, colorful, soulful, bold, surprising and playful. They will put a smile on your face every time you look at them. I welcome custom requests and would love to collaborate with you to come up with that perfect piece to co ordinate with your home decor, textiles and furniture. In this digital age, I work with customers all over the workd via the internet. I am based in Australia but I can ship my products anywhere in the world. All of my designs are for sale on any product you see showcased here and if you can't see the product but like the design - please contact me to see if I can offer it to you. Colours can be changed and designs can be personalised. My designs are diverse but I do specialise in children's rooms, nursery decor, bathroom decor and kids wall art. I can offer you designs on many home decor products including rugs, duvets, sheets, throw pillows, throw blankets, shower curtains, bath mats, curtains and more. I have an extensive collection of designs and I work with manufacturing partners all over the world to bring together my artwork and sell homedecor products that can be shipped directly to you. All custom requests are welcome. Timothy White is an Australian ceramicist who has been perfecting his art for over 25 years. Celebrated for his absolutely unique and original artworks, his pieces have been spotted in a number of exclusive and boutique galleries around Victoria. Having completed a Diploma of Art Design, followed by Graduate Diploma of Education (Art & Craft) Tim’s work is not only marked with his personal stamp of authenticity it is also much sought after. Whether you’re looking for a fun and functional piece, such as ceramics or pottery, or prefer murals and decorative painting, you’ll find many Endeavour Hills, Victoria artists, muralists and artisans on our Professional pages, ready to include you in a creative process that will result in a stylish and personality-filled home. There are a wide selection of Endeavour Hills, Victoria artisans listed on Houzz, including muralists, painters, ceramic artists, potters, ironworkers, photographers, sculpturalists, designers of decorative glass, metal wall art, abstract art, home accessories, and more. Even everyday items such as tableware, tiles, splashbacks, lampshades and bedheads can be handcrafted, painted or designed by an artisan. You will also find artisans who specialise in bespoke designs, as well as those who offer artwork consultancy. Find artists and craftsmen on Houzz. Peruse portfolios in the Professionals section to find abstract, traditional, and contemporary artists in Endeavour Hills, Victoria. Read reviews and contact artists directly to ask them more about their work.